Deborah Reed, professor in the UK College of Nursing, was honored for her work educating farmers about occupational health and safety. LEXINGTON, Ky. (Nov. 9, 2018) – Deborah Reed, Ph.D., professor in the University of Kentucky College of Nursing, was honored with the Edge Runner Award from the American Academy of Nursing for her work educating farmers about occupational health, safety and disease prevention on farms. The Edge Runner initiative recognizes nurse-designed models of care and interventions that impact cost, improve health care quality and enhance consumer satisfaction. Through its Edge Runner program, the Academy is mobilizing its fellows, health leaders and partner organizations to recognize nurses who are leading the way with new ideas to transform the health system. Reed designed the Farm Theater Dinner intervention which educates farmers on the health crises they face; the physical intensity of the work can leave farmers with conditions such as arthritis, hearing loss, hypertension, skin cancer, cataracts and musculoskeletal disorders. Farmers are also at risk for nonfatal and fatal injuries and increased risk of suicide. Over 97 percent of America’s farms are still family owned and operated and are exempt from OSHA regulations; therefore, all attempts to implement health and safety precautions are dependent upon the farm families themselves. Raised on a Kentucky farm 15 miles outside of Lexington, Reed understands farmers’ attitudes toward traditional forms of occupational safety education. 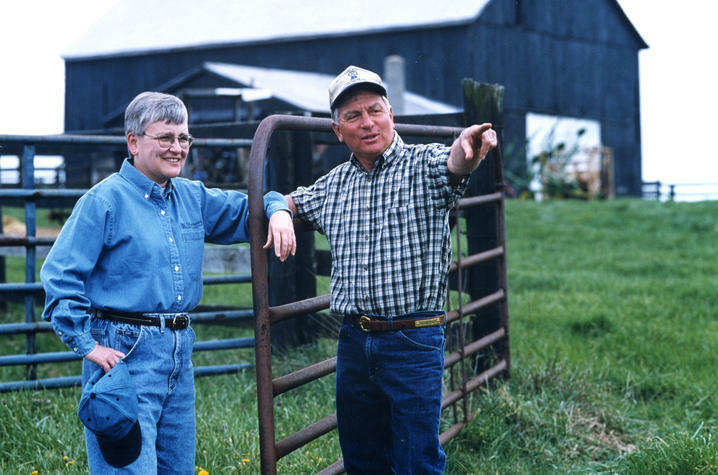 She has conducted community-based research on Kentucky’s farms for more than 25 years. Her research has shown farmers aren’t persuaded by lectures and pamphlets and don’t have time in their demanding work schedule to attend educational meetings. The Farm Theater Dinner program entertains Kentucky and Tennessee farmers with a meal and a farm-friendly theater performance embedded with important health and safety messages. But more than just a date night off the farm, these casual events are also influencing behaviors, with results of a study showing that farmers are thinking more about occupational safety and implementing precautions as a result of attending the forum-style dinners. Organized by researchers in the UK College of Nursing, the Farm Theater Dinners feature a 10-minute play performed by local volunteer actors. The scripts are based on interviews and stories from real Kentucky and Tennessee farmers. The plays also contain implicit messages about occupational safety and health risks specific to the farming profession. While enjoying a collegial atmosphere and a night off the farm, farmers are presented with realistic safety and health topics on the farm, which they discuss as a group at the conclusion of the performance. Reed received her bachelor's and master's in nursing, master's in public health and her Ph.D. all from UK. She holds a joint appointment in the Department of Preventive Medicine in the UK College of Public Health. Reed is the director of the newly funded Occupational Health Nurse Ph.D. Training Program, funded by the National Institute for Occupational Health and Safety (NIOSH) as part of the Central Appalachian Educational Research Center.